"Our customers are fans of puppytooth shirts. We keep making them in new colors, and there doesn’t seem to be enough shades to revisit them in. I understand it: they’re easy to pair with ties, the subtle texture adds interest to your look and they last a great deal of time." "Made from a 100% Egyptian cotton puppytooth weave for soft touch and strength." The product description is that the material is Egyptian cotton. The tag on the shirt says the material is just cotton. Every other shirt in my wardrobe that is Egyptian cotton describes it as such on the tag. Those shirts are also much softer. This is the only reason for the 2 stars. Otherwise, it's a beautiful well fitting shirt. 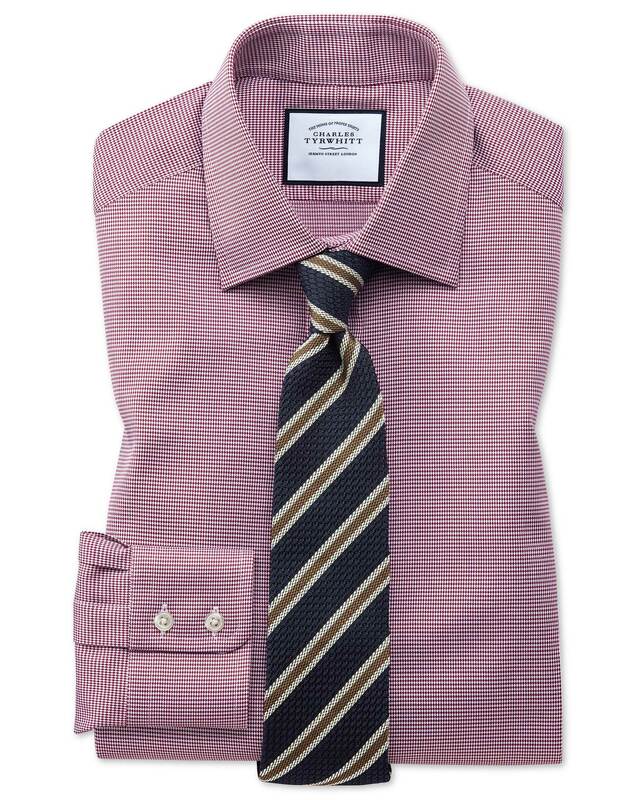 Response from Charles Tyrwhitt: I do apologise for the concern over the cotton used in this shirt. While I certainly raise your concerns with the Products Team, I am confident that the shirt is indeed Egyptian cotton. We don't actually write 'Egyptian' on the shirts themselves, however, so please don't be alarmed that this is missing. While I am sure the shirt will soften over time, you do of course retain the option of making a return if you won't be able to enjoy this beautiful shirt. Any reference in an ad to fiber content, including the name of a particular kind of cotton, a cotton trademark or other term implying the presence of a type of cotton, must not be false, deceptive or misleading as to fiber content. If your ad uses the name of a particular type of cotton, a cotton trademark or other term implying the presence of a type of cotton, include that information on the product’s content label. If it were Egyptian Cotton the label would state that. Response from Charles Tyrwhitt: I apologise for any confusion; however I can confirm that all of our shirts, whether they be standard range, regular iron Egyptian cotton, or our Luxury range will all state simply 100% cotton on the care label, as this is the fibre composition. We clearly advertise that the fabric is Egyptian cotton on our product details, and as this is not a trademarked title it is not required information for a care label, particularly in the UK where our company is based. It is possible that the other Egyptian cotton shirts you have in your wardrobe are of a different weave, which can affect how the fabric feels. Of course, as offered previously, you are of course more than welcome to exchange this shirt should you not find it suitable.